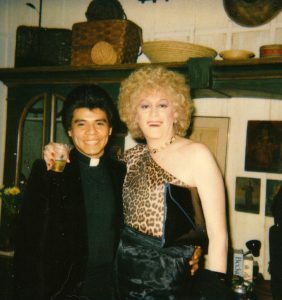 In the spring of 1983 gay activist Morris Kight invited me to attend the 13th investiture of the Imperial Court of Los Angeles and Hollywood at his home on McCadden Place in Hollywood. A drag queen and her muscle boys. Morris Kight is in the background, left. Click for more photos. 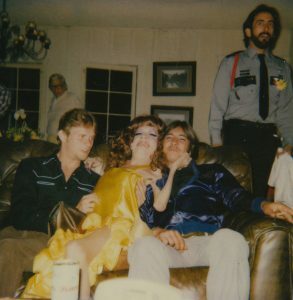 I’m not sure Morris really fit in with the odd assortment of drag queens, muscle boys and leather men who crowded into his living room that night. But the court was an efficient fundraising machine and Morris was the consummate politician—so the connection was secure. I was intrigued by the Imperial Court, the pre-Stonewall organization that put on campy drag balls complete with mock royalty and no small measure of drama and palace intrigue. It seemed a throwback to an earlier, far less liberated time. And so I showed up with a cassette recorder and a Polaroid camera to document the fading glory of the court system. A drag queen seeks divine guidance. I soon discovered that my preconceived notions widely missed the mark. These fearless, fabulous “drag persons” lived life on their own terms, breaking down barriers and upending stereotypes with the snap of a finger. And, they assured me, they weren’t going anywhere. Thanks to the ONE National Gay and Lesbian Archives, my recordings of the event have been digitally preserved. Although excerpts were aired on KPFK 90.7 FM in 1983, this is the first time the full recordings have been available. Morris Kight provides historical background on the court system and his understanding of its function. Empress Nicole the Great of San Diego, who is still active in the Imperial Court, discusses the role of the court in the gay and lesbian community. And she notes the role of drag queens in the Stonewall rebellion, which was largely overlooked at the time. Two longtime drag queens discuss their experiences passing for women, hustling and picking up straight men. Empress Hazel d’Royale, the incoming empress of Los Angeles and Hollywood, talks about the emerging threat of AIDS to the community. The following is a half-hour recording of the investiture itself, including a dispute over Emperor Cameron’s leave of absence.